You may find something in some piano music and it's in Bb and you'd like to play it in a more suitable key for the ukulele like C or A. Or, it may be that you need to play the song in a key that's easier for you to play or sing. Perhaps you found that the song is too low for you to sing and you need to play it just a little bit higher. If you run into any of these problems you can still play the song using the sheet music or any version you found, you'll just need to know how to change the key so that you can play it in a more suitable key. ​If a song is too high, too low or in a key you don’t want to play it in, you can change the key of the song, so that it is easier to play or in a key that you know better! To do this change all of the chords using the chart below. Most songs for the ukulele are transposed into the keys of C or G.
Songs that are in Minor Keys are usually in Am or Em. 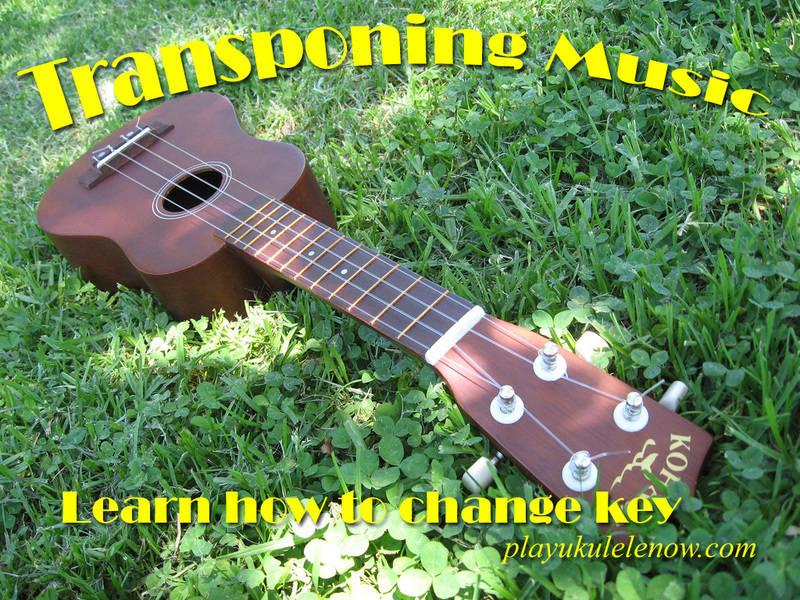 The relative minor keys of C and G.
Down in the Valley and Skip to my Lou are in the Play Ukulele NOW Method and Songbook and in the Free eBook and are great easy songs that can be used to try new things. When trying new accompaniments or techniques, it's a good idea to use easy songs you are already familiar with. Down in the Valley and Skip to my Lou appear in the key of C in the Play Ukulele NOW Method, If you would like to play Down in the Valley or Skip to my Lou it a little higher, transpose it to D, the C becomes a D and the G7 becomes an A7. Take a few songs and transpose them to different keys. Don’t move too far up or down the chart away from the original key, the song could easily get too be high or too low. First try some songs that are in C and have only 2 chords, (typically, for a song in the key of C with 2 chords, the chords would be C and G7). You'll find some songs like that here in our FREE eBook, click here to get yours. 1. First transpose them to D, the C becomes a D and the G7 becomes an A7. 2. Then try them in A, the C becomes an A and the G7 becomes an E7. This covers just the basics of using the transposition chart. There is allot to this chart and we can have quite a few future lessons on using it. What if the chord is not on the chart. What if the chord is a little bit different than a chord on the chart? 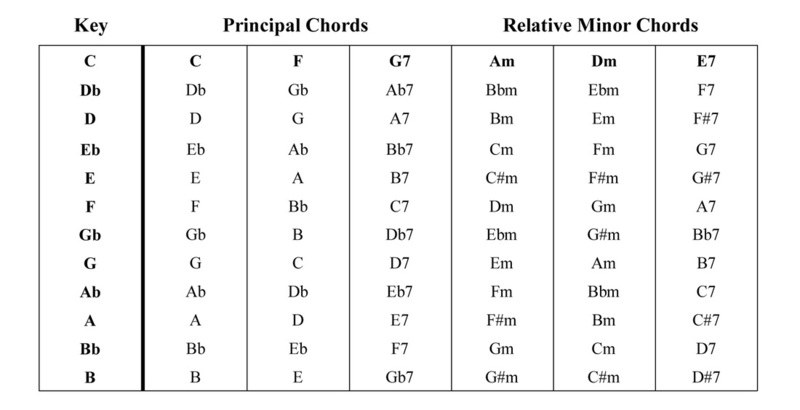 This chart can also be used to study the principal and relative minor chords. 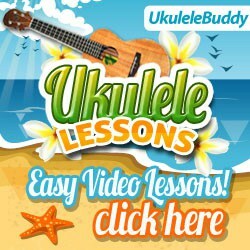 Don't have the Play ukulele NOW Method and Songbook yet? Click here to get yours.